Chloe Dalton and Brooke Walker have signed on as AFLW rookies for 2019. 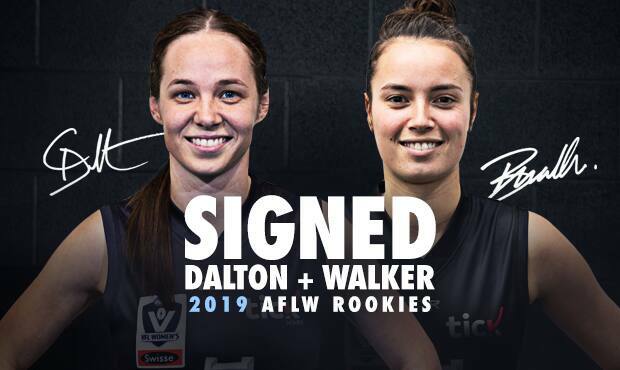 CARLTON Football Club is delighted to announce Chloe Dalton and Brooke Walker will transition to its AFL Women’s list, after signing on as rookies for the 2019 season. The talented duo has been playing for the Blues’ VFLW side this season since crossing codes from women’s rugby sevens earlier this year. A member of Australia’s history-making gold medal team at the Rio Olympics, Dalton has applied the same level of professionalism to her newfound Aussie Rules career. In a testament to her character and commitment to the Blues’ VFLW team, the 25-year-old was named deputy vice-captain of the inaugural side and has played 11 games this season. In Round 4 against Geelong, Dalton showcased her trademark sidestep and dash, collecting 13 disposals, five tackles and booting her first goal. Having also represented her country in the same code, Walker moved from Sydney to Melbourne in order to pursue her ambition of playing in the AFLW. Since making her VFLW debut in Round 1 against the Southern Saints, the 23-year-old has played every game this season and has been a solid contributor in defence. Running off the half-back line, Walker gathered 11 disposals and laid seven tackles against Casey in Round 13. Senior AFLW coach Daniel Harford said he was delighted Dalton and Walker will join the Blues’ AFLW program. “Chloe and Brooke will add another layer to our AFLW list and we’re rapt they’ll pull on the navy blue in 2019. They have worked really hard during the VFLW season to improve their skills and gain a greater understanding of the game,” Harford said. “The way Chloe runs through the middle and sidesteps the opposition is exciting to watch and her tackling is a real strength. Combine her running capability and leadership qualities and we think she will be a strong addition to our line-up next season. “Brooke is also a tackling machine and she loves the contest. The fact she’s come from an elite sporting background means she has already established a strong tank so we look forward to welcoming her on our AFLW list for 2019. The 2018 AFLW rookie signing period closes on Friday 28 September.